Q: Our son has contracted his first case of poison ivy this season. What is the best over-the-counter treatment? At what point would he need a prescription? Poison ivy contains an oil called urushiol. About 85 percent of people are allergic to urushiol and will develop a rash from direct contact. Sometimes, a rash can occur after indirect contact, for example via a pet, clothing or camping equipment. The rash typically will appear about 12 hours after exposure and may worsen or progress over the next several days. 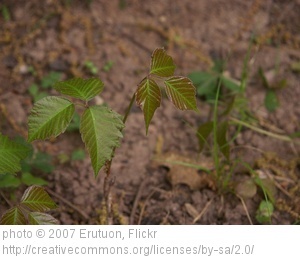 To prevent poison ivy, it is important to be able to identify and avoid the plant. Remember the phrase, Leaves of three, beware of me. If poison ivy cannot be avoided, then wear long pants, long sleeves, gloves and consider applying a barrier cream such as bentoquatum. If your son comes into contact with poison ivy, he should wash the area with cold water (and soap if available) immediately to remove the oil from the skin. If rash develops, oatmeal baths, calamine lotion or Burrows solution may be helpful for symptomatic relief. Creams and ointments that contain benzocaine, zirconium or antihistamines should be avoided because some people are allergic to these ingredients. Oral antihistamines, such as Benadryl, may help relieve itching. A person should seek medical treatment if the rash is widespread, near the eyes, if he or she has an underlying skin condition such as eczema or psoriasis, or if the rash is not resolving after a week. More information about poison ivy is available at aad.org.